Was born in 1865. He is a son of the Rev. G. Ward-Humphreys, of Clifton, and was educated at Clifton, studying law and engineering, and finally entered the medical profession, practising at Cheltenham and in London. Mr. Ward-Humphreys is a ‘live’ yachtsman, and ever since his association with the sport has taken an active and personal interest both in the racing and its legislature. His racing is principally confined to the Solent and South Coast, and he has owned many yachts of note. In 1895 he started his career with the Nicholson 30-footer Corolla, a most successful boat, which is still racing. Next came the Nicholson 24-footer Babette, and a little later the Nicholson 24-footer Eumeria and the Payne 5-rater Eudeia. The Sibbick fast cruiser Saionara also became Mr. Ward-Humphreys’ property, and with her he won a great number of prizes, including the Dart­mouth Town Cup. He also owned the famous ½-rater Jeanie ; the Payne-designed Audrey; Delia, a 25-ton lugger ; Qui Vive, a 9-ton yawl designed by himself and built by Burt ; Sunset, a Falmouth Quay punt designed by Burt ; and the 8-ton fin keel cruiser Coya, designed by himself and built by Sibbick. Mr. Ward-Humphreys’ name will, however, be associated with two of his yachts, Japonica and Marjory. 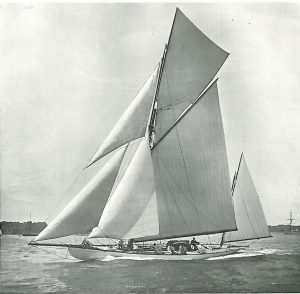 The former was the Herreshoff 20-rater Niagara, which was purchased and raced with marked success. She won the Nore to Dover Coronation Cup, the Royal Yacht Squadron Handicap, the Royal Southern Handicap (twice), the Wey­mouth Town Cup twice, the Rothschild Prize at Havre, and a host of other valuable and important trophies. Japonica, Ex Niagara, Yawl, 30 tons. Mr. G. H. Ward-Humphries. In 1899 Harley Mead designed Marjory as a speculation. She was of the extreme type, and immediately on her appearance Mr. Ward-Humphreys saw her capabilities, and promptly purchased her. So successfully was she raced that for two years she was champion in her class in the Solent. Imitators soon appeared, and the success of the type brought about the abolition of the then existing measurement rule. Her dimensions were 48 feet over all, 25 feet water-line, with 8 feet beam. Mr. Ward-Humphreys is an ardent supporter of the fin and bulb for small yachts, and his Japonica was the first of that type under the L. and S.A. rule. Her old rival Audrey is now also owned by him. Mr. Ward-Humphreys is a keen boat sailer, and in 1901 he judged the races for the Seawanhaka Cup while on a visit to Canada. He is a member of the Yacht Racing Association. Clubs: Royal Victoria, Royal Southern, Royal Albert, Royal Thames, Royal Eastern, Castle, Island Sailing, Solent, Seaview, Falmouth Sailing.